Happy Sunday Funday! I hope you have some interesting plans for today. Weekends always seem to fly by before I get a chance to savor it. Today we have a lot planned, from DH getting his haircut, to the festival by the beach, then later to the pumpkin patch for LO and to finish at our favorite vegan restaurant. I don't know if we'll get it all done, but one can hope! Today I'm starting with Essie Vested Interest, one of the newest offerings from this year's fall collection. It's a dusty blue teal cream that is not terribly unique but I'm a sucker for the shade so I always pick it up. From what I heard, it's nearly a dupe for Bobbing For Baubles. Formula was very liquidy but didn't flood my cuticles upon application. I used two coats here with no topcoat. I participated in TPF's indie round robin swap box and picked up Darling Diva's Lovely Lilacs in the exchange. I thought it would look perfect over the teal of Vest Interest and applied one coat via the dab and swab method. Lovely Lilacs has an assortment of satin white, purple, yellow, pink and white hexes in an iridescent shimmering clear base. Formula seemed good except for the glitters not wanting to come off the brush unless I dabbed. I finished this with a layer of my Poshe/GCS mixed topcoat. Look at the shimmah!! 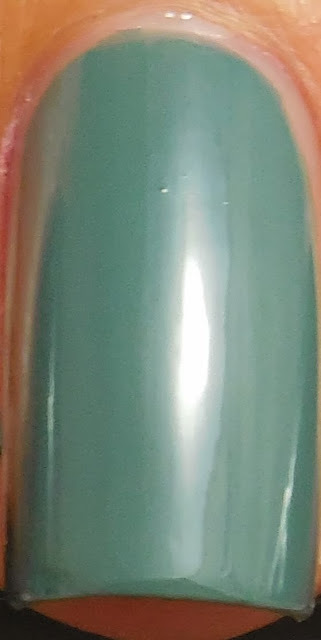 The iridescence really gives a basic glitter topcoat incredible magical depth. This is the first that I've tried this brand of indie polish and I gotta say I really love it. I definitely plan on keeping an eye on the going ons of this brand in the future. Have you tried this line before? thank you! this shade is one of those colors that I think would look good on everyone, probably because of that gray. This is an amazing combination! I LOVE it. Lovely Lilacs is beautiful! I should have got that one when it was available but I only started buying indies in December. Darling Diva is awesome, I have a couple. You should totally get Ringer. It's a dupe for Max Factor Fantasy Fire. Oh and Space Beetle! I've always eyed Ringer! I love duochromes like that. My wallet wishes there weren't so many awesome indies out there. LOVE Vested Interest... I've had my eye on this one. Your combo is gorgeous, the purples and pinks really pop over the dusty teal -- great layering picks!